One of the strategies being pursued for ramping up the accomplishments and impact of Geoscience Education Research (GER) is to foster a "GER Community of Practice." This page provides an introduction to CoP's, proposes some reasons to think that fostering a GER CoP would be useful, and introduces a systems model for thinking about what drives and sustains successful CoP's. The Domain: an area of concern or passion. In our case, this is Geoscience Education Research. The Community: a group of connected people who interact regularly. We have begun to connect and interact and are trying to figure out how do so regularly. The Practice: ideas, frameworks, tools, documents, ways of doing things, narratives, exemplars, that the community shares. Building this Toolbox is an effort to gather and share the artifacts of our practice. The purpose of the community is to build competence and capacity in the practice so as to advance/improve the domain of concern or passion. Learning and improving in the practice--by both individuals and the collective--is central to the CoP concept. can have formal leaders--or not. Why do we think that a CoP would be useful for advancing GER? All of the DBER's (Discipline-based Education Research fields) struggle with bringing research into practice and achieving uptake of their research findings in the classroom (Singer, et al, 2012). CoP events can establish a "trading zone" where researchers and practitioners can meet, where practitioners' challenges and insights can help to steer research efforts, and where researchers' findings can migrate towards action. A CoP can support individuals, by helping them overcome a sense of isolation, find collaborators and a network of like-minded colleagues, access targeted professional development opportunities, and build their career in this new discipline. A CoP can accumulate and create community-wide capacities. A CoP can curate and disseminate the artifacts that embody these capacities, as exemplified by the building of this Toolbox. In addition to sharing existing tools and knowledge, a CoP can invent new and better ways of doing things. It has been our experience that well-functioning CoP's energize their participants and engender deep loyalty. Participants feel good during community of practice interactions, and seek out more such interactions. As a result CoP's can move metaphorical mountains. They accomplish amazing things relative to their available resources. As scholars who sit at the boundary between geosciences and social sciences, we can leverage our geoscience habits of mind to think about both social systems and Earth systems. In this spirit, Kastens (2016) has proposed a conceptual systems dynamic model for what drives successful CoP's. 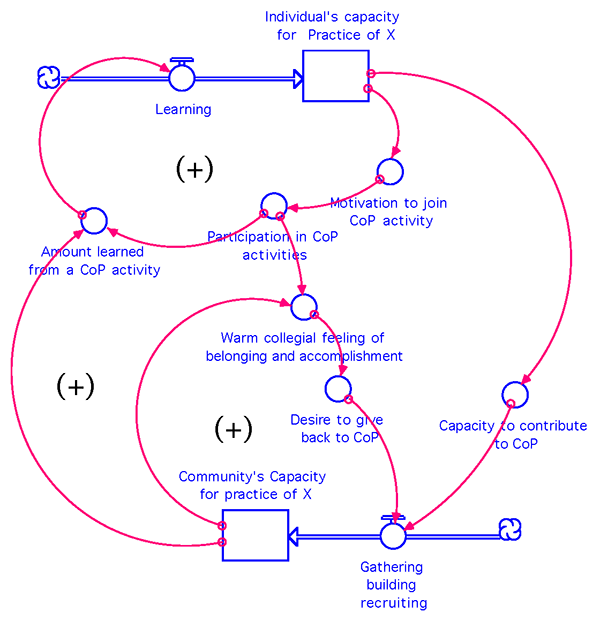 STELLA model of a community of practice as nested reinforcing feedback loops. The behavior that this model seeks to recreate is that both the individual's capacity and the community's capacity for the practice ratchet up over time as the CoP activities play out. Such a ratcheting in one direction seems to call for reinforcing (aka "positive") feedback loop(s). In fact, this model has three interlocking reinforcing feedback loops. The first, at the top of the diagram, involves the individual learning though participation in the the CoP's activities. The second, circumnavigating the outside of the diagram, has the individual contributing more to the community as his/her capacity to contribute rises, and conversely has the community providing more to the individual as the community's capacity rises. The real driver of the system, though, is the small loop at the bottom of the diagram, which concerns affect and emotion. Capacity to contribute to the CoP is useless without desire to contribute to the community, which in this model is driven by a warm collegial feeling of belonging and accomplishment. This model is new and untested. But to the extent that it rings true to the CoP builders, it carries two lessons. First, both the individual and the collective need to benefit from CoP activities; both need to be continually building up capacity for the practice. If the individuals aren't benefiting, they won't come back and they won't contribute. If the collective is not benefitting, the practice won't move forward and the CoP will have nothing new to offer to the individuals. Secondly, that "warm collegial feeling of belonging and accomplishment" needs to be nurtured and fostered. It's not just a lovely side benefit; it's at the heart of what makes the CoP tick. Barab, S., et al. (2004). Designing system dualities: Characterizing an online professional development community, in Designing for Virtual Communities in the Service of Learning. S. Barab, R. Kling and J. Gray (eds). Cambridge, MA, Cambridge University Press: 53-90. Galison, P. (1997). Image and logic: A material culture of microphysics. Chicago: University of Chicago Press. Source of the idea of a "trading zone," the intersection zone where different practitioners can find overlap among their professional aspirations and practices to get things done together. Kastens, K. A. (2010) Congratulations to On The Cutting Edge: Reflections on the founding of the GeoEd CoP. Kastens, K. A. (2016) Reinforcing feedback loops power effective communities of practice, in Earth & Mind: The Blog. Lave, J., & Wenger, E. (1991). Situated Learning: Legitimate peripheral participation. Cambridge: Cambridge University Press. Origin of the concept and term "Community of Practice." Lukes, L. A., LaDue, N. D., Cheek, K. A., Ryker, K., & St. John, K. (2015). Creating a community of practice around Geoscience Education Research: NAGT-GER. Journal of Geoscience Education, 63, 1-6. Singer, S. A., Nielsen, N. R., & Schweingruber, H. A. (2012). Discipline-based education research. Washington, D.C.: National Academy Press. Wenger-Trayner, E., & Wenger-Trayner, B. (2015). Communities of practice: A brief introduction.